The Basic Hydraulics textbook opens with a thorough description of hydraulic principles. Subsequent lessons then describe the various components that make up a complete system, beginning with hydraulic fluid and progressing through the various mechanical components. The textbook describes a wide variety of hydraulic cylinders and motors. 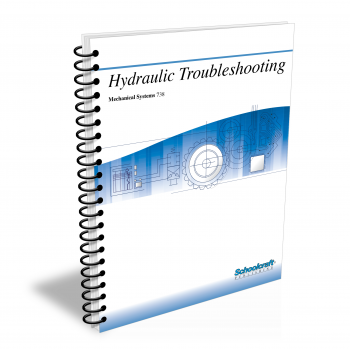 This textbook is a prerequisite for the 738 textbook, Hydraulic Troubleshooting. Does your curriculum require additional topics not included in this textbook? Build a customized version of the Basic Hydraulics textbook below. to include topics lists, objectives, & key terms for every chapter. Explain the difference between absolute and gauge pressure. Demonstrate how power is calculated. Describe the difference between laminar and turbulent flow. Name the main components of a hydraulic system. List the most important properties of hydraulic fluids. Explain how viscosity is measured. Explain the meaning of the viscosity index. Describe the effect of fluid temperature on viscosity. Name the causes of corrosion and fluid oxidation. Identify various types of hydraulic fluids. Name contaminants found in hydraulic systems. Explain the difference between a strainer and a filter, and describe the main function of each. Describe the two basic types of filter/strainer media. Draw graphic symbols for strainers and filters. Explain the functions of fluid reservoirs. Explain the purpose of reservoir baffles. Describe various methods of counteracting high operating temperatures. Identify important accessories used with reservoirs. Demonstrate pressure ratio calculation for a differential-piston accumulator. Name the main classification of hydraulic pumps. List factors affecting pump selection and pump performance. Define volumetric efficiency and overall efficiency. Identify the most common types of positive-displacement pumps, and describe their operation. Discuss the chief considerations in hydraulic line selection. Demonstrate how flow velocity and pressure loss are calculated. Describe various types of fittings used in hydraulic systems. Explain the reason for using steel pipe. List the main advantages of tubing. Explain the classification of directional control valves. Describe how manually operated valves work. Explain the difference between direct-acting and pilot-operated valves. Describe the operation of a check valve, a spool valve, a three-way valve, a four-way valve, and a rotary valve. Explain the difference between normally closed and normally open valves. Explain the functions of a pressure-control valve, a pressure-relief valve, and a pressure-reducing valve. Describe the operation of a spool valve, a poppet valve, and a sequence valve. Explain the purpose of holding valves, unloading valves, and counterbalance valves. Name the operations performed by flow-control valves. Describe how pressure compensation and temperature compensation work. Describe the purpose of a hydraulic cylinder, and explain how a double-acting cylinder works. Explain the difference between "pull-type" and "push-type" single-acting cylinders. Describe the construction of a hydraulic cylinder. Explain the various methods of mounting cylinders. Demonstrate how to calculate the flow capacity of a hydraulic cylinder. Explain the classification of hydraulic motors. Demonstrate how the torque of a hydraulic motor is calculated. Calculate the horsepower output of a hydraulic motor. Discuss cost factors and other considerations affecting motor selection. Describe the construction of a hydraulic motor. Explain the operating principles of a gear motor, a vane motor, and a piston motor. Our topics cover a broad and diverse spectrum of subject matter, from reading blueprints to electrical schematics, measurement to rigging and safety, material handling to welding, and everything in between! Choose only the lessons that meet your specific curriculum requirements. 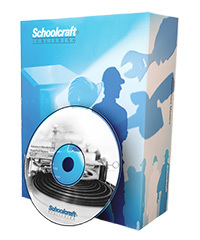 Once your draft is submitted, a Schoolcraft Representative will reach out to discuss and help build your ideal book. To continue adding additional chapters from other textbooks, return to our technical library here. Ready to see a copy of our textbooks? After selecting which textbooks you’d like to review for your course, you can submit your request by either logging in or creating an account so we know where to ship your exam copies. A representative from Schoolcraft will contact you to confirm and finish processing your request. Exam copies are always free and yours to keep.